NASA astronauts Randy Bresnik (left) and Joe Acaba take a spacewalk outside the International Space Station on Oct. 20, 2017. Two NASA astronauts tackled a third spacewalk in just two weeks today (Oct. 20), venturing outside the International Space Station to install a new high-definition camera, replace another faulty camera and take care of other routine maintenance on the orbiting laboratory. Expedition 53 Cmdr. Randy Bresnik and flight engineer Joe Acaba began their extravehicular activity (EVA) just slightly ahead of schedule, at 7:47 a.m. EDT (1147 GMT) today. Despite a few setbacks, they were able to complete all of their assigned tasks and a handful of "get-ahead" tasks during the 6-hour-and-49-minute excursion. During a spacewalk on Oct. 20, NASA astronaut Joe Acaba worked on the new latching end effector at the Canadarm2 robotic arm outside the International Space Station. Canadarm2 and the LEE are used to robotically grapple incoming cargo spacecraft, and with a Cygnus cargo shipment scheduled to arrive on Nov. 13, NASA needed to ensure that the camera would be functioning properly. Originally, Bresnik was going to replace a different camera outside the Destiny module, because it was producing a picture with a yellow hue. That camera is not a high priority and will be replaced on a later date, NASA officials said. Before Acaba set out to work on the new LEE, he installed a new HD camera on the space station's starboard truss. Less than an hour into the spacewalk, Acaba noted that one of the tethers connecting him to the space station had some "wear and tear" on it, so Bresnik brought him some spare tethers, just to be safe. With a fresh set of tethers, Acaba installed the new HD camera and moved on to the LEE. Using a foot restraint to help him reach the end of the robotic arm, Acaba swapped out the degraded camera. After that, he had enough time left to move on to a "get-ahead" task, which involved adding lubricant to eight linear bearing tracks inside the LEE. 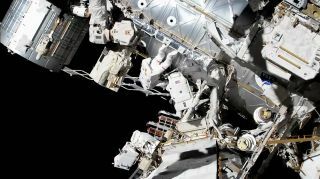 This completes the installation of the new LEE, which astronauts have worked on during all three spacewalks this month. NASA astronaut Joe Acaba installed a new HD camera on the space station's starboard truss, his helmet camera caught his reflection in the shiny new equipment. Near the end of today's spacewalk, Acaba encountered some more technical difficulties, this time with his jetpack. The Simplified Aid for EVA Rescue (SAFER) jetpack is attached to each spacewalker's extravehicular mobility unit (EMU), or spacesuit, just in case an astronaut were to become detached from the ISS. The handle on his jetpack had somehow gotten bumped out of configuration. "That SAFER is considered not to be operational at the moment," NASA TV commentator Rob Navias said during a live webcast of today's spacewalk. "However, because Acaba is so close to the Quest airlock and will not require any swapping of tethers on his way back to the airlock, he is go to continue the cleanup work at the latching end effector. He has wrapped up all of the lubrication work and all of his get-ahead tasks for this spacewalk." Bresnik's tasks for the day included the replacement of a failed fuse on a robotic platform known as the Special Purpose Dexterous Manipulator, or "Dextre." He also removed some insulation on a spare electrical component known as a Main Bus Switching Unit, which will enable "easier access for robotic replacement tasks should that be required in the future," Navias said. This was the fifth spacewalk of Bresnik's career, and he has now accrued a total of 32 hours of spacewalking time. Acaba has now completed his third spacewalk, with a total of 19 hours and 46 minutes spent spacewalking.